This kit contains all you need to grow dwarf sedum plants in an upcycled wine bottle. Grow a little green oasis in your life, whether it's at your busy workplace or in the quiet of your favorite reading nook. This terrarium kit contains all you need to grow a blend of dwarf sedum--a kind of pint-sized, easy-care greenery that offers intricate paths for your imagination to wander. Your little biodome is made from a repurposed wine bottle, and rests on a base of bamboo chopsticks that double as tools for tending your tiny garden. Made in Idaho. 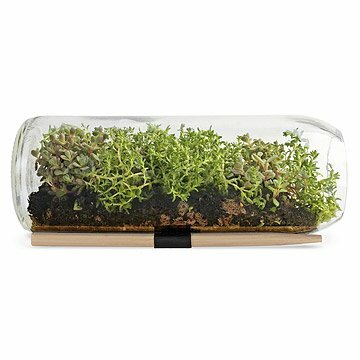 Please click here for a complete PDF of the Sedum Terrarium Bottle instructions. The Sedum Terrarium watering will vary with environment and location. We recommend watering when the soil appears dry. In the colder months, terrarium may retain more moisture requiring less watering. Detailed instructions included with each kit. Great Gift for that Man in your life! I love this product! Great set up and looks super! Great for the office to warch it grow. Many visits from coworkers to check on progress. After 6 months it all died. Is a replacement seed pouch possible to order? Loved the idea, but my sister, who is very experienced with all types of plants, couldn't get it to grow. The plants look very sparse in the bottle. Disappointed! The glass gets watermarks from dried droplets, and forms new droplets on the top from humidity. Both make the glass just look dirty. It's NOT crystal clear, like the picture. Also the sedum has grown between 1 and 4 mm in height, so realize that it will take a LONG time to grow into a display-able piece. I bought it to display in an exam room, but the fact that the glass is too dirty to peer through combined with the fact that the plants aren't worth looking at anyway made me return the item. Great gift for a plant lover! Very cool gift for someone who loves plants! Great for a bookshelf or desk. I was worried about it breaking during shipping, but it was perfect when it arrived. It is a great product fun to watch. Although the first time the terrarium didn't grow, UncommonGoods quickly sent another and this time it has turned out very well. My brother really enjoys it. It brings a little green into his life in the city. This is a great gift for someone to put on their desk. It is full of life and was fun to watch it grow. I placed it in the window with my other plants. It has already started to sprout. It is fun to check out the progress each day.